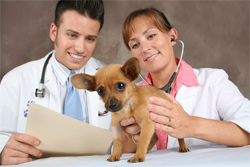 deciding on the right veterinarian can feel like an overwhelming process. going with reviews and opinions. Are Your Dog's Teeth Healthy? IYour dog's happy, carefree life should be unbothered by dental concerns, right? Think again. Vets say 85 percent of canines over age 4 have some form of gum disease. Other frequent problems include crooked, cracked or loose teeth, an infection or an abscess. it's not just chocolate you need to avoid. Pet insurance is a controversial topic among pet owners. Some people love it, while others think it's a waste of money. Exercising your dog is good for many reasons; it helps with physical and mental health and can also reduce unwanted behaviors like chewing furniture from bored or anxious pups. Specific health benefits you'll get by sharing your life with a pet. be sure to do a little research first. While nutrition science isn't perfect, it's the best approach we have to figure out how to best feed our pets. Does Fido destroy your shoes, claw the door, or bark incessantly while you're gone? He could have separation anxiety. What breed has a higher chance of getting epilepsy or glaucoma? Wagging tails and wet noses can come with more than you bargained for.